Publishing novels serially is a very old idea. Most of Charles Dickens work came out that way. What I’ve done over the last few years in the blog Serial is a bit different. Dickens novels came out in pieces while he was writing them. Everything in my blog Serial was already finished, then had to be reverse engineered into serial form. I actually made a brief attempt at writing on the go, although it appeared in A Writing Life while Serial was occupied by another story. It wasn’t for me. If you’re curious how things came out in the experiment, you can go to Mud Prolog, Mud 1, Mud 2, and Mud 3 to see the results. I have a lot of emotional investment in the novel Mud and some day I will probably return to it, but not as a serial in progress. When Dickens wrote his serialized novels, the size required for each chunk was known in advance and the chunks were big. David Copperfield, for example, was a novel of 358,551 words. I know this by downloading it from Project Gutenberg, transferring it to my word processor, and using the word count function. You might make note of that; it is a useful technique. David Copperfield was published in twenty monthly installments. That makes each installment was about 18,000 words. 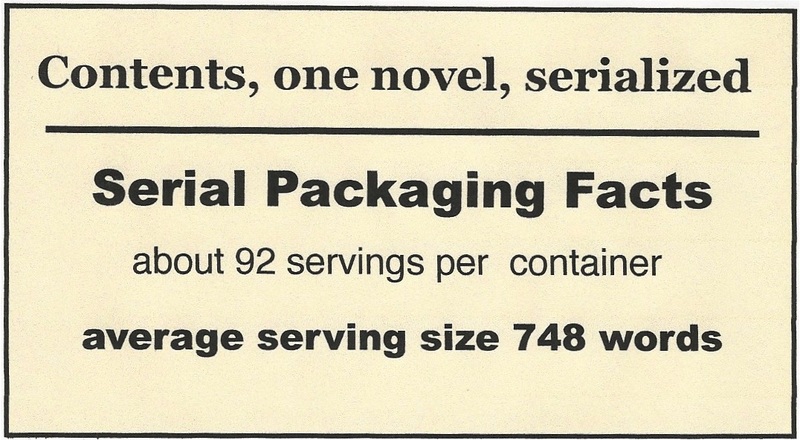 In SFWA (Science Fiction Writers of America) terms, each installment was of novella length. My typical serial post has been about 600 to 800 words. Dickens serialized in order to sell to a market which could not afford books. At the same time, serializing boosted sales of this novels when they came out later in book form. Most successful nineteenth century authors followed the same pattern. 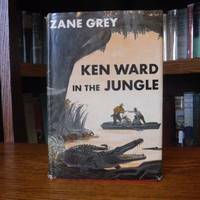 The big names in twentieth century science fiction also wrote serial novels, although they were shorter and presented in fewer but longer installments. 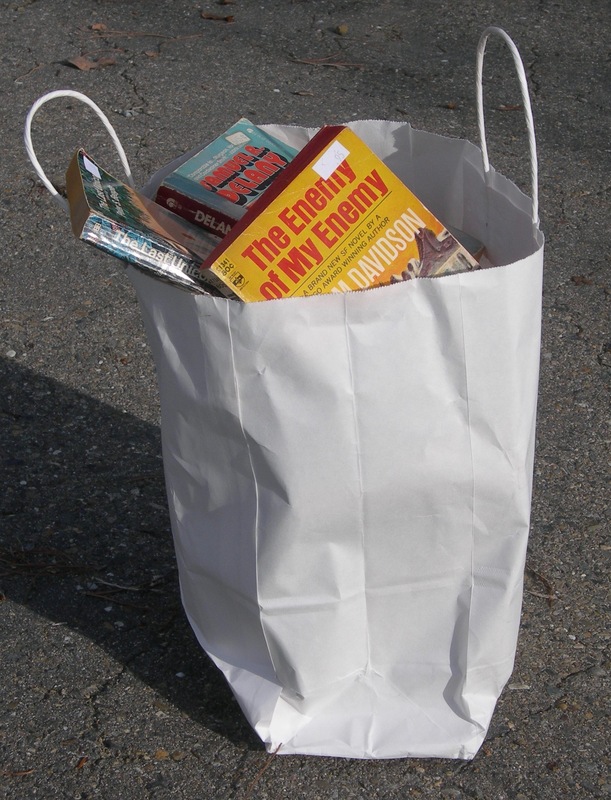 In the golden age of SF, serial publication might be the only way to get a novel into print. A few years later, when the paperback revolution came about, those old magazines were mined for their novels. In my case, nothing but Mud was in progress at the time it was posted. Some of the things presented had been published, some had not, one was presented as a excerpt from a completed novel, and one was a fragment from a novel I’ll probably never finish. Jandrax was annotated to such a degree that it almost forms a writing primer, and How to Build a Culture was entirely a how-to. Everything I have presented in Serial has been to assure continued readership of the website. It’s a trick. Leave ‘em hanging, and they’ll come back. And the whole website was originally to assure a readership for my then upcoming novel Cyan, and for others that would follow. That was the plan anyway, but the website quickly became something I valued for itself and man has it been fun. I’ve enjoyed revisiting old friends. I’ve learned a lot from a close re-reading of old material, especially regarding pacing. Since I posted four days a week, each post had to be relatively short. That kept me from running out of material too soon, and kept each reading experience brief for the sake of the daily reader. I didn’t originally choose the 600 to 800 word length — it just evolved. The actual process of taking a novel and breaking it into pieces has been a fascinating, frustrating, and rewarding experience. It typically begins with a completed novel, which may be decades old and which will already have been polished to a high shine. Nevertheless, I find a few errors. The first step is to reduce the novel to individual pages. I use a stationary belt sander to remove the gummed spine. How’s that for getting down to how-to basics? These pages then have to be scanned one at a time with an OCR program (optical character recognition) to make them readable to the word processor. Then I have to find all the thousands of errors that crept in during OCR work. It takes a week, at least. Now using a word processor version, I have to re-read the novel, looking for natural breaks in the action. I type a non-word at each break. I use breakbreak. Then I can use the find function to jump from break to break. I then highlight what I have chosen, use the word count function, and type in the number of words. If it seems too short or too long, I adjust. That takes care of post #1. Now to repeat. Jandrax required 92 posts. Raven’s Run required 150. Some posts make sense on their own, but some require that I start with a sentence or two from the previous day’s post. 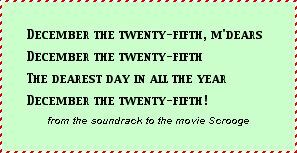 I use bold-italic to denote this repeat. All this takes place on a single word processor file. I then make individual files of each post-to-be. This is a backup to what will actually appear on the website. At this point, I run the spell checker one last time, even though by now I have read each section repeatedly with an eye out for errors. The last step is copying from word processor file to the website. Tedious? Yes. Fun? Absolutely. If you don’t enjoy re-reading your own work, why do you write? If memory is nagging at you, then yes, a very different version of this appeared in a previous post a couple of years ago. This entry was posted in A Writing Life and tagged blogging, fantasy fiction, Jandrax, literature, science fiction, writing on January 14, 2019 by sydlogsdon. When I began this website in 2015, it was to be in two equal but very different formats. The blog called A Writing Life was mostly to be in the form of mini-essays, and the blog called Serial was to be a place to showcase my writing. Both halves worked out very well until recently when the well ran dry for Serial. Here is part of what I said in the first Serial post, August 29, 2015. Starting September first, this space will be home to serial fiction. When I first began to consider serial publication in this website, I had a particular kind of reader in mind. I envisioned a train or bus commuter, or a bored backseater in a car pool, surrounded by distractions. (Not a driver. If you’re driving right now, turn off your damned smart phone!) I thought that kind of a reader would appreciate a short presentation, half a satisfying read and half a tease for tomorrow’s installment. As it turned out, I don’t think very many commuters ever read Serial. From feedback, I think it was read mostly by other bloggers. Running two blogs on one site renders the results of the stats provided by WordPress pretty questionable, but as nearly as I can judge about the same number of readers have enjoyed Serial as they have A Writing Life. The process of serializing is a complex one, which I will talk about next Monday. Once again, according to stats which don’t seem too reliable, the Backfile page remained largely unread. Too bad, there is a treasure trove of stories there. Over the years, Serial has allowed me to provide a variety of types of fiction and non-fiction, and some that was a little of both. Jandrax was reprinted there, but not simply as a serialized novel. It was annotated, so that you could look over my shoulder as I told about the writing of it, and admitted to the things that now make me cringe. The novel fragment Voices in the Walls told the story of its writing, explained how it came to remain uncompleted, and gave an outline of what might have been. 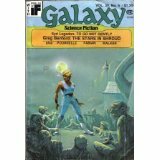 To Go Not Gently was the cover story of the a 1978 issue of Galaxy. It was also the original novella form of A Fond Farewell to Dying. The Serial blog rescued it from oblivion. All good things must end, or at least pause. In September of 2018 I put Serial on hiatus because I had run out of suitable materials. I revived it briefly during Christmas, and may do so again in the future. Stay tuned. This entry was posted in A Writing Life and tagged blogging, fantasy fiction, Jandrax, literature, science fiction, writing on January 9, 2019 by sydlogsdon. Let me offer a slightly belated Happy New Year. My first post of the year was tied in to the last/first/only year of the novel Like Clockwork, and my second was an apology for any posts that might be missing this month. I still may miss some, but I am trying to avoid that. Since we are in the month of beginnings, I thought I would remind my newer followers how this enterprise started. 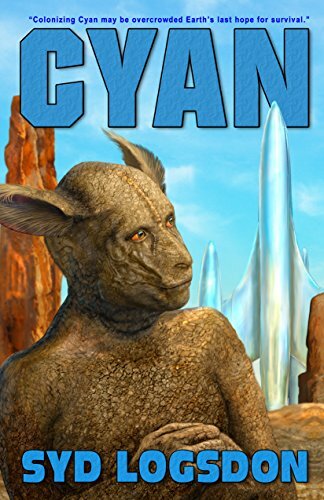 In 2015, EDGE publisher bought my SF novel Cyan, to be released as an e-book in their new EDGE lite (dumb name) line. In honor of that — which is a sneaky way of saying to drum up business for that — I began a blog. By the way, if you haven’t bought Cyan yet (and why haven’t you? ), you can pick it up from Amazon as an ebook or paperback. Actually, I began a website containing two blogs. The website was to be called A Writing Life and the two blogs were to be called A Writing Life and Serial. It was a glaringly bad decision to call the site and one of the blogs by the same name, but I’m stuck with it now. Cyan was due out at the beginning of 2016 and actually came out nearly a year and a half late. I had the embarrassing task of explaining every delay in the blog. A few things changed over the years. It quickly became obvious that running A Writing Life (the blog) four days a week and Serial five days a week was an unnecessary complication. I dropped Serial to four days a week early on. After nearly four hundred posts of the A Writing Life blog, the four day a week schedule became unsupportable and I dropped to two days a week. Serial changed as well, but I’ll talk about that on Wednesday. This entry was posted in A Writing Life and tagged blogging, literature, memoir, science fiction, steampunk, writing on January 7, 2019 by sydlogsdon. So what, you may ask, is a quilt doing in a writing post? No writer just writes. My wife and I both discovered quilting in the mid-eighties. For me, it was an art form in which I could satisfy myself. My painting always lacked something, to my eye, but quilts are colorful geometric things with utility. I could make a quilt and not feel artistically inadequate. 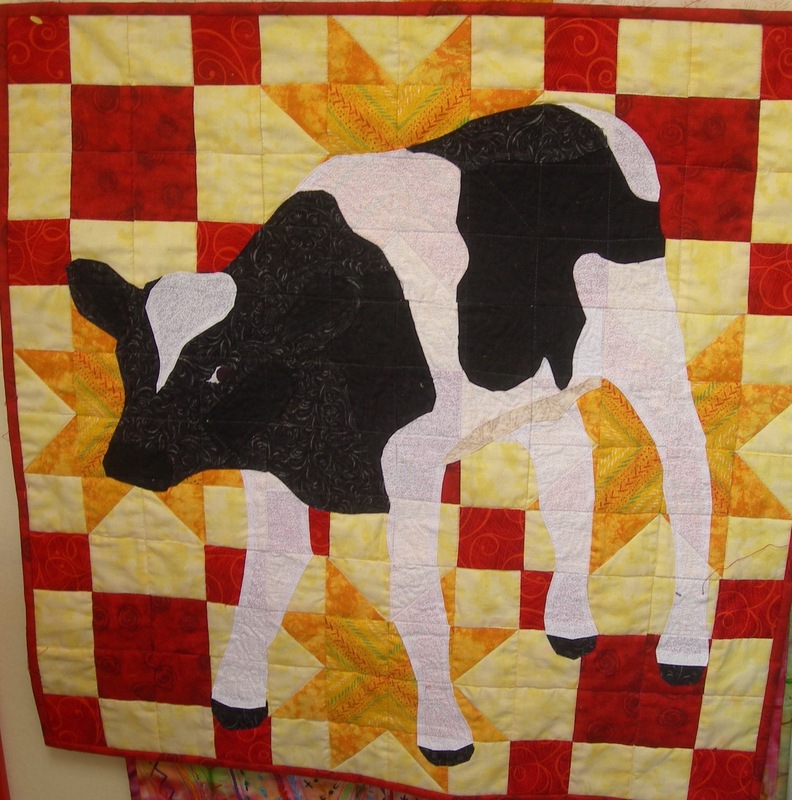 For about a decade we have been deeply involved in putting together a quilt show for my wife’s guild every other year. In 2017 I took some time off from this blog, and I may have to do so again this year. All this is simply to point out that if posts get scarce this month, nothing is wrong. I am just busy with a different piece of my life. This entry was posted in A Writing Life and tagged americana, blogging, memoir, writing on January 2, 2019 by sydlogsdon.